What drew me into the world of the Cardboard Gods as much as anything else was its clean, well-defined system of statistical landmarks. You knew where you stood with the numbers on the back of a baseball player’s card. If a guy hit 30 home runs and drove in 100 runs, he was a star slugger. If another guy turned in a sub-3.00 ERA, he was a top pitcher. It was as simple as that, no gray areas, no confusion. This is part of why people become religious, I think. They’re looking for clear guidelines on what’s good and what isn’t. For starting pitchers, it’s all about wins. If you win 20 games, you’re an ace. Conversely, if you lose 20 games, you’re kind of a rag arm, a luckless mushballer (though probably not utterly incompetent; after all, your team must have seen reason to keep running you out to the hill to take all those beatings). These seemingly mutually exclusive starting pitcher landmarks were well-known to me by the time I started inspecting the baffling statistics on the back of Wilbur Wood’s card. In a five-year span, the aging knuckleballer with the 19th century name won 20 games four times, but he also lost 20 games twice, 19 games once, and 17 games once. 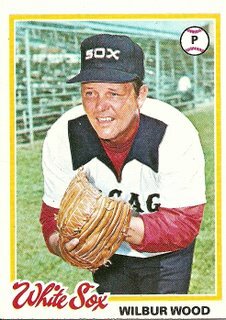 The most confusing year of all was 1973, when Wilbur Wood achieved both plateaus in the same year, racking up 24 wins while also suffering 20 losses. I couldn’t figure out right away if Wilbur Wood was bad or good, but eventually I came to see him as being in both name and deed some kind of a throwback to the rugged spike-gashing dawn of major league baseball, when hurlers started both ends of a doubleheader and then came on in relief despite massive corn liquor hangovers the next day at dusk to strand the go-ahead and winning runs in scoring position. Wilbur Wood was beyond Old School. He was Old Testament. He was the last vestige of a time when men named Rube and Mordecai and Smokey Joe and Grover strode as giants upon the land, their won-loss records both gleaming and gory, good and bad entangled. When Wilbur Wood hung it up, it left no one to stop the meek 5-inning starters and 4-pitch bullpen specialists from inheriting the earth. You are currently browsing the archives for the Wilbur Wood category.